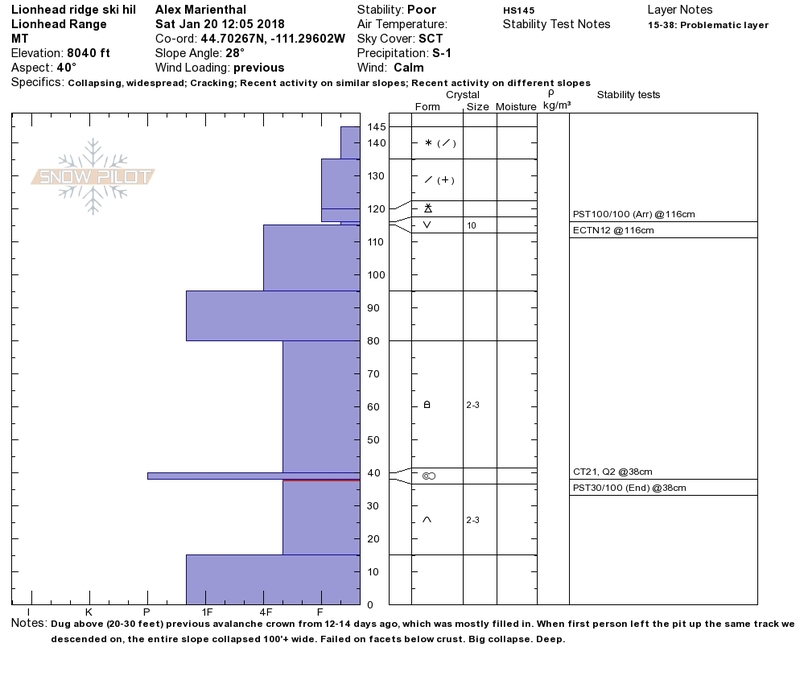 The crown on this slide ranges from 4-6' deep. 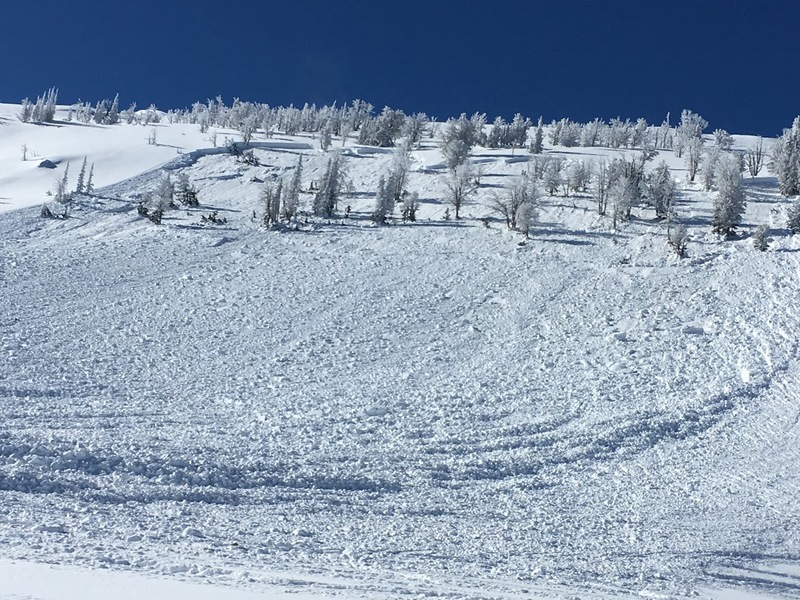 It occurred on a heavily wind loaded slope and broke on facets near the ground. 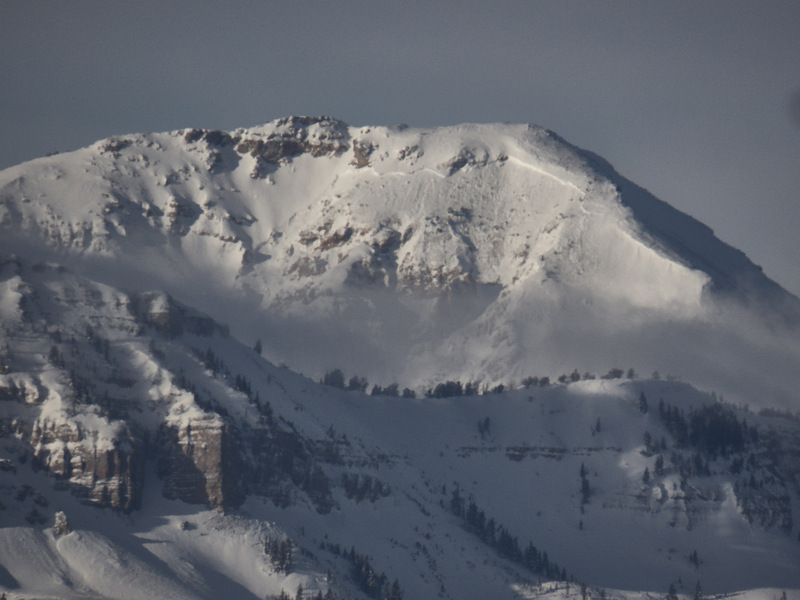 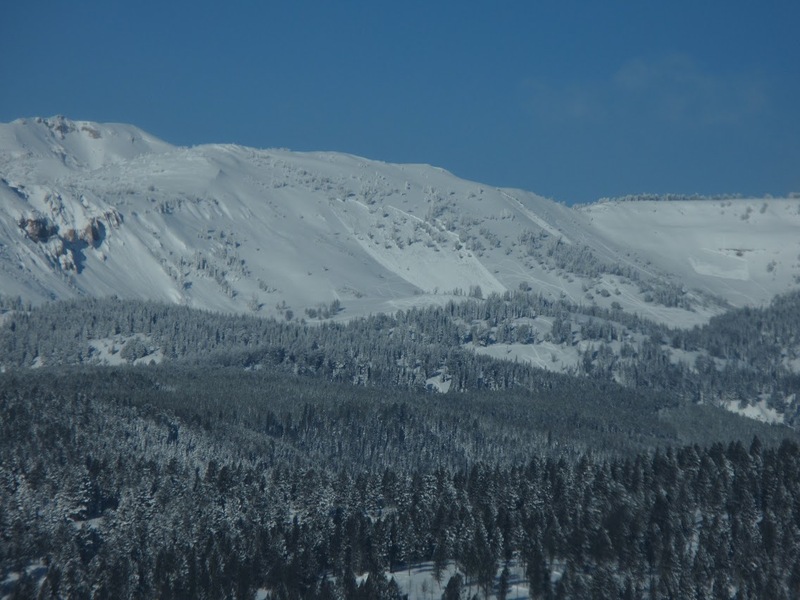 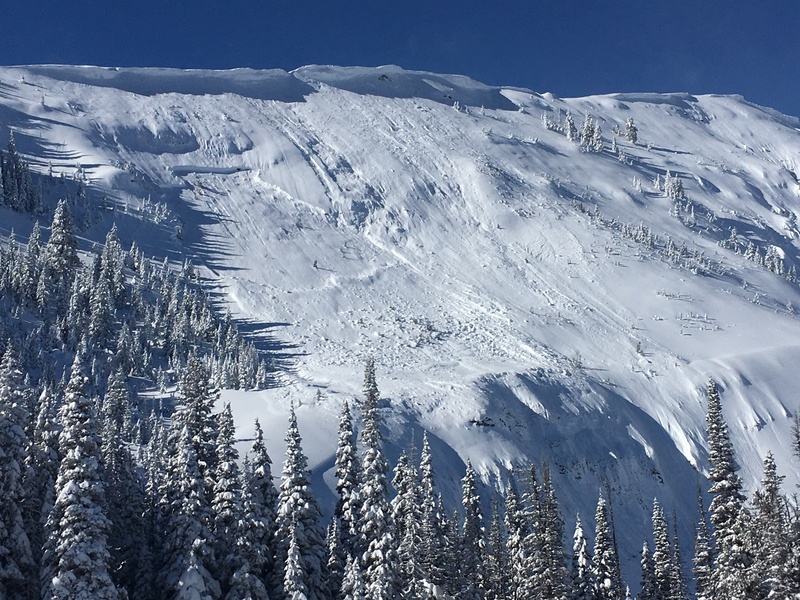 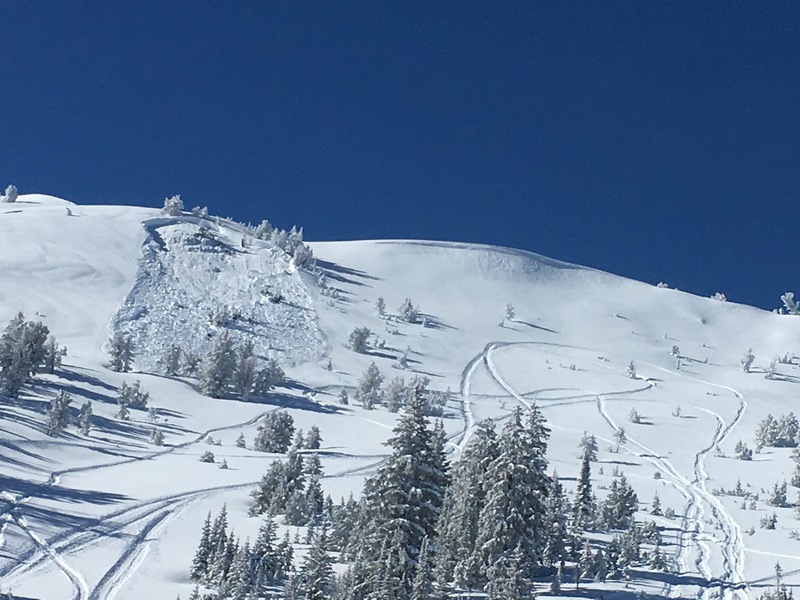 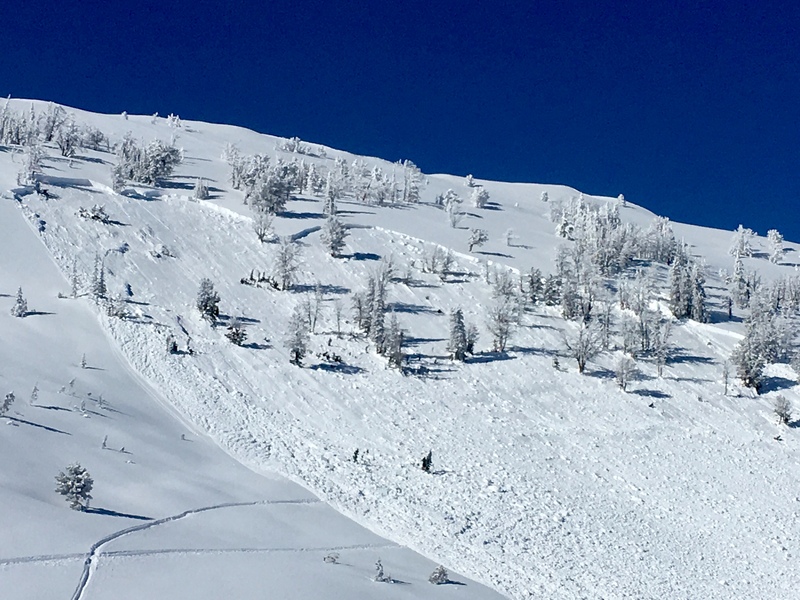 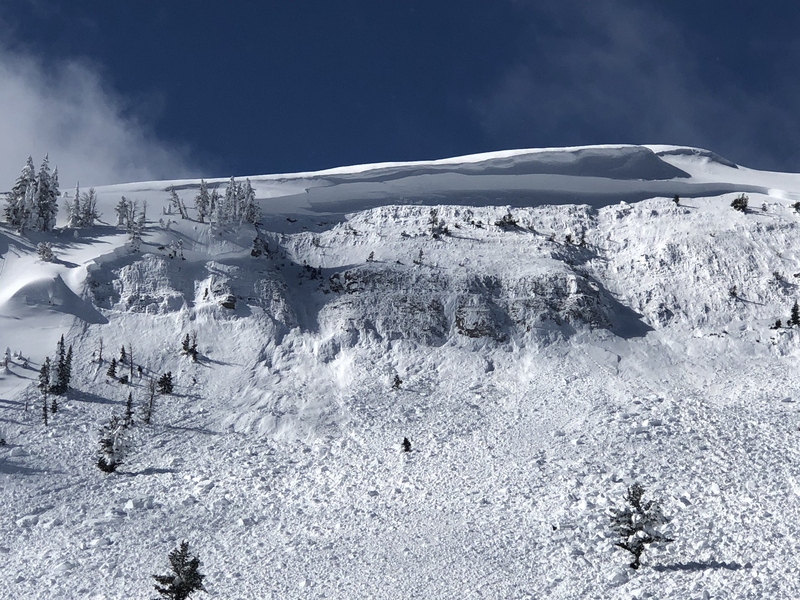 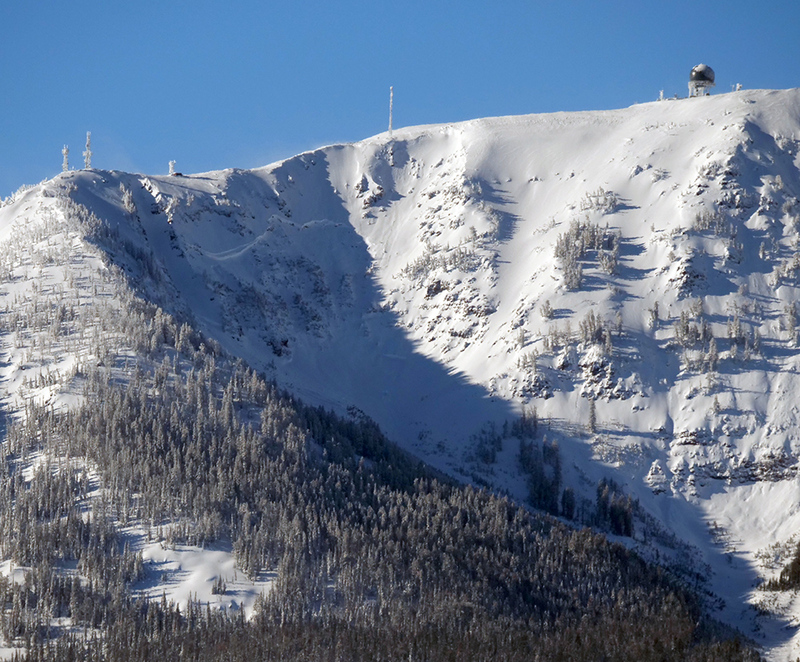 It's a clear reminder that large avalanches are possible in the mountains near West Yellowstone. 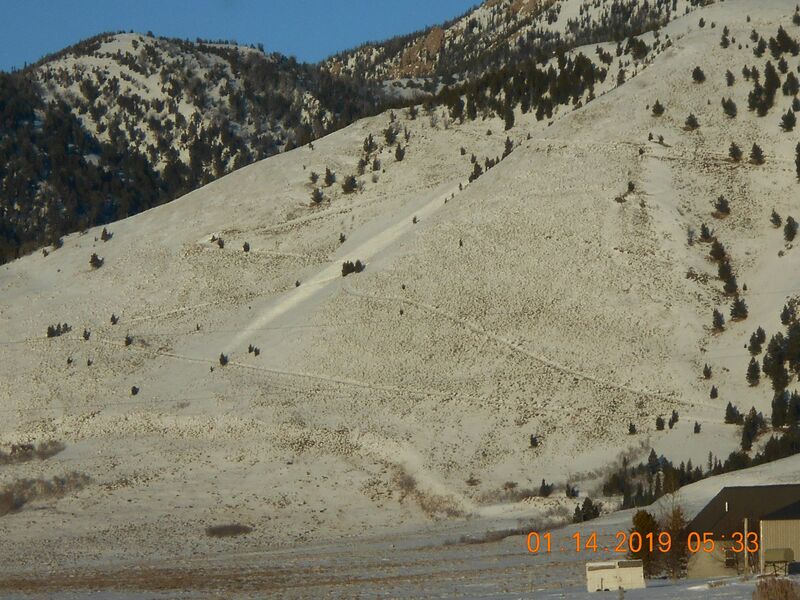 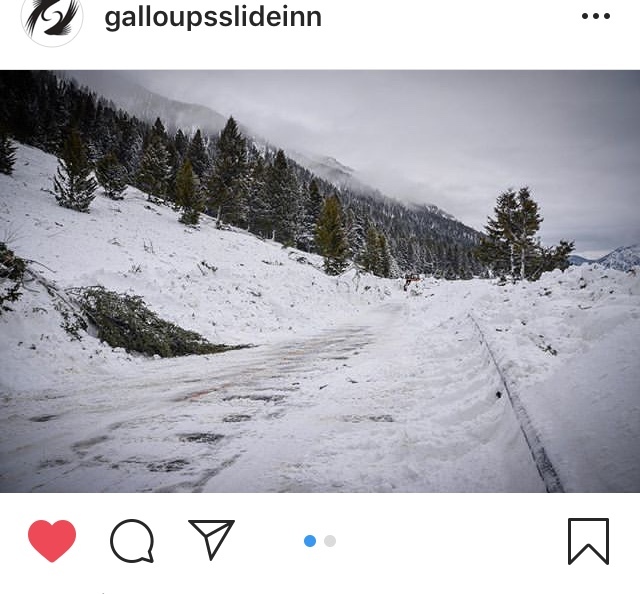 This slide occurred in the Lionhead area near West Yellowstone. 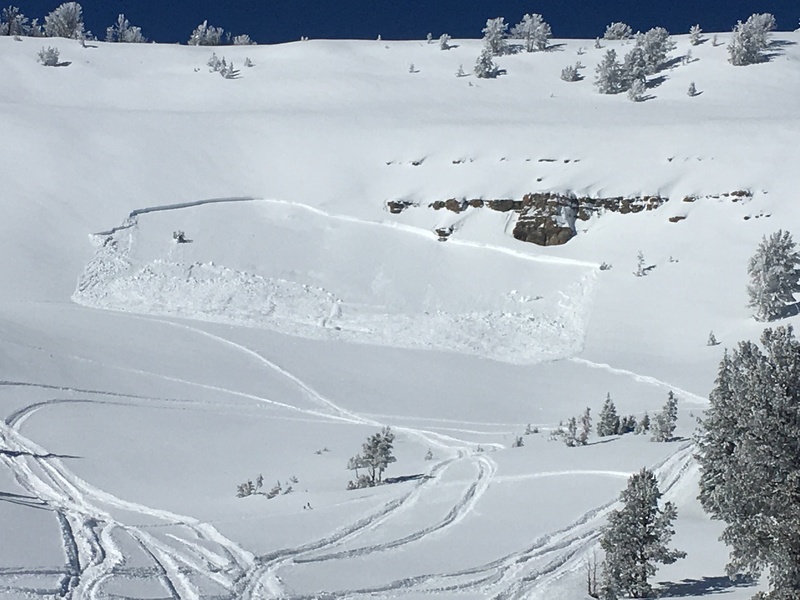 It broke 4-6' deep, failing on facets near the ground. 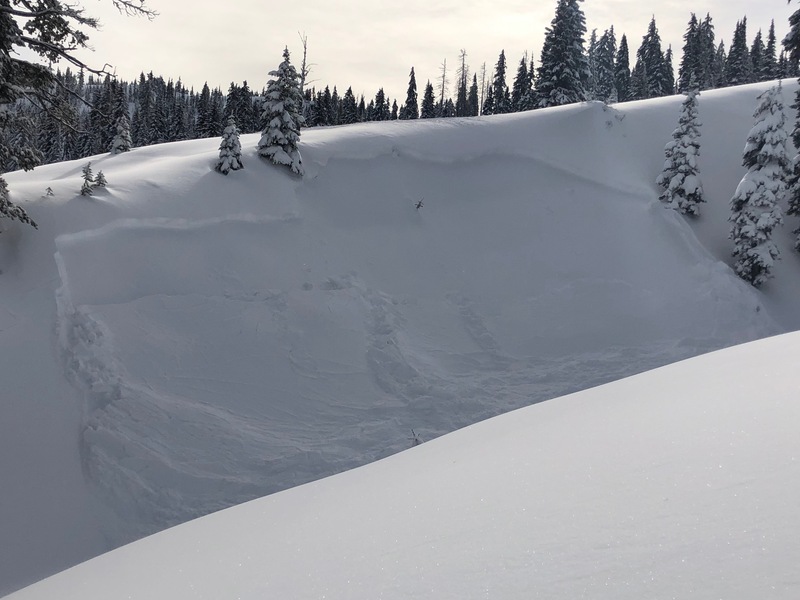 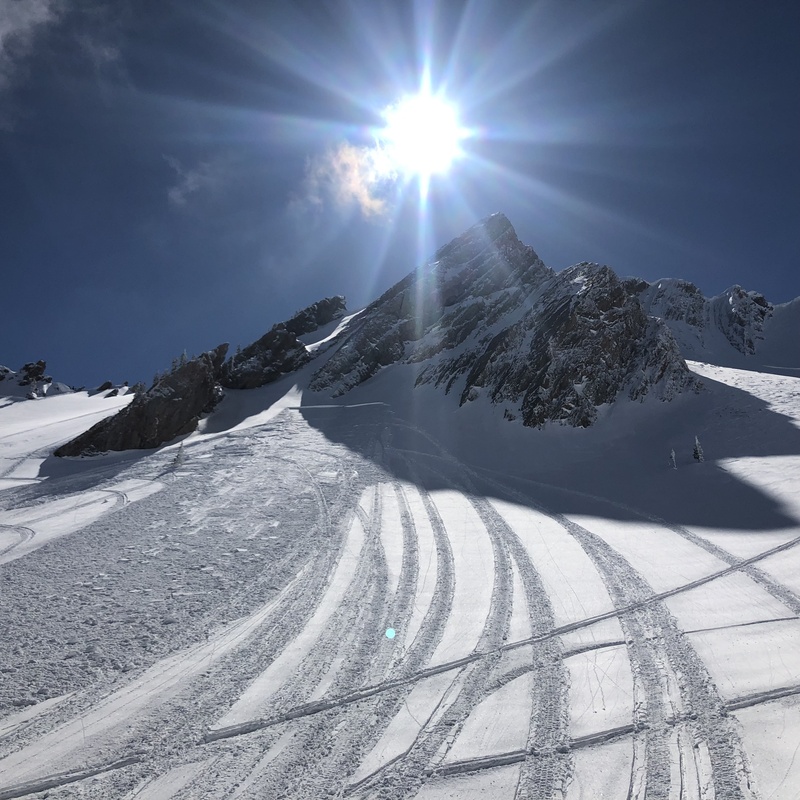 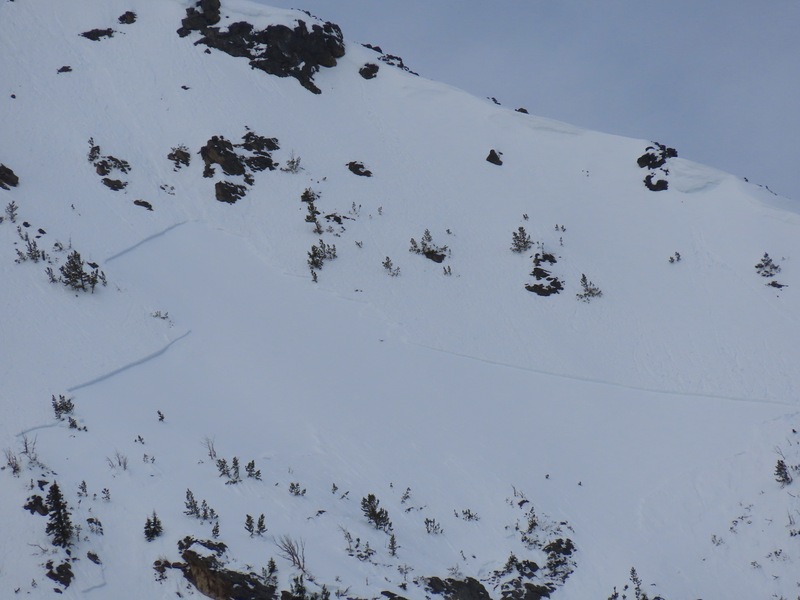 It's unknown if it was triggered by a natural cornice failure or by a snowmobiler. 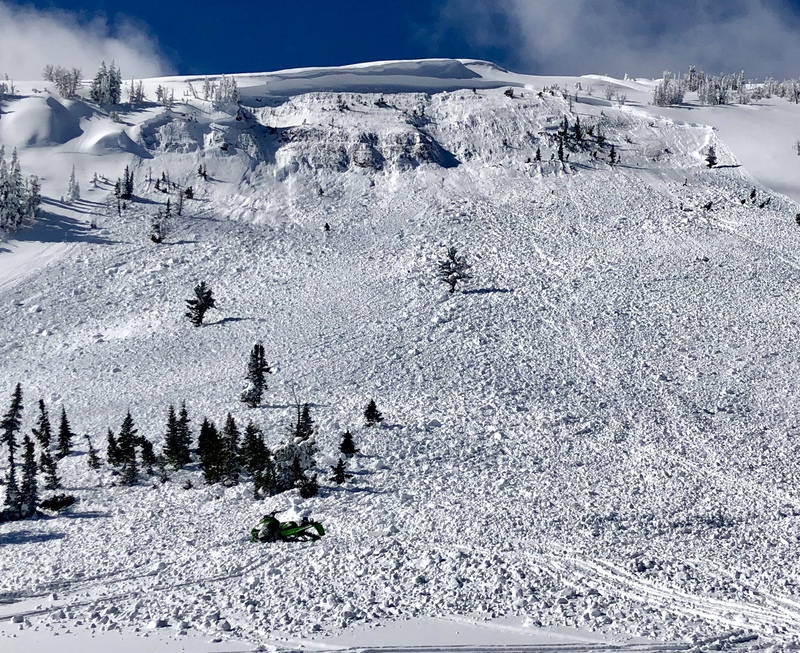 Either way, it's a clear reminder that large avalanches are possible in the mountains near West Yellowstone. 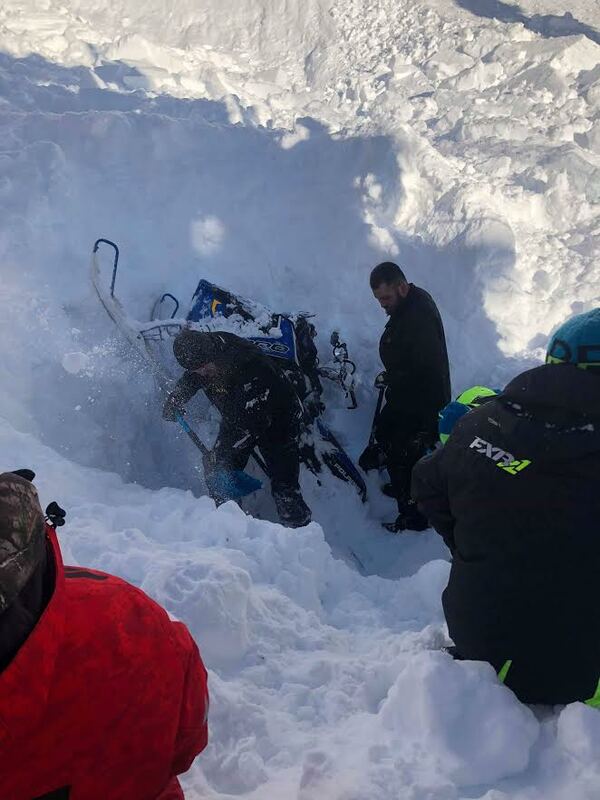 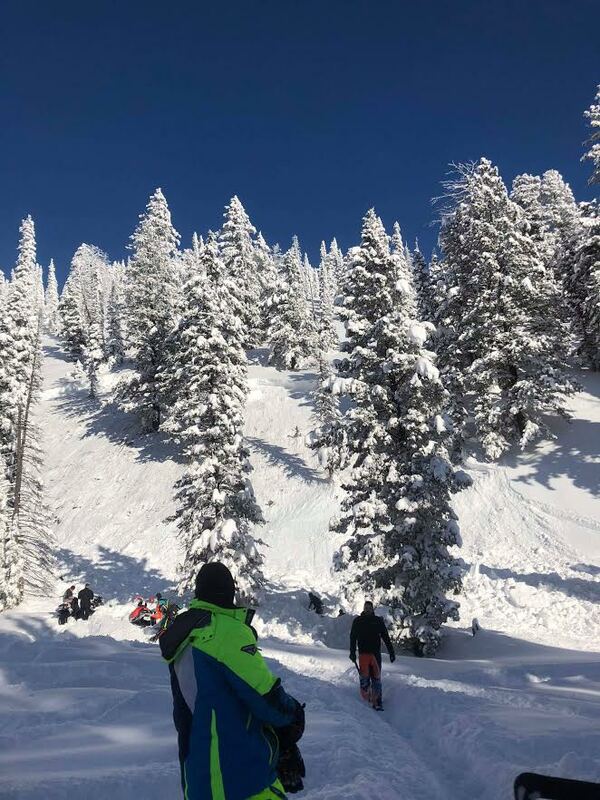 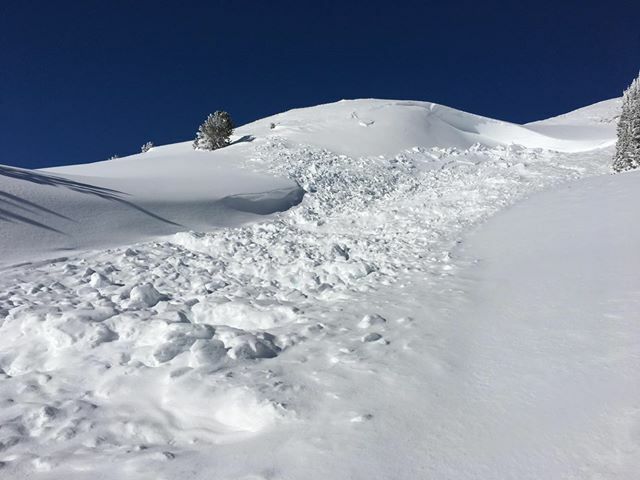 From facebook: "natural avalanche down near reynolds pass. 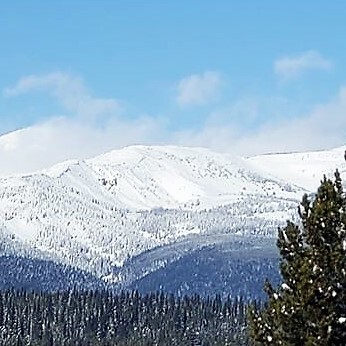 West facing slope, it faces hwy 87 and is named mile Creek trail by usfs. 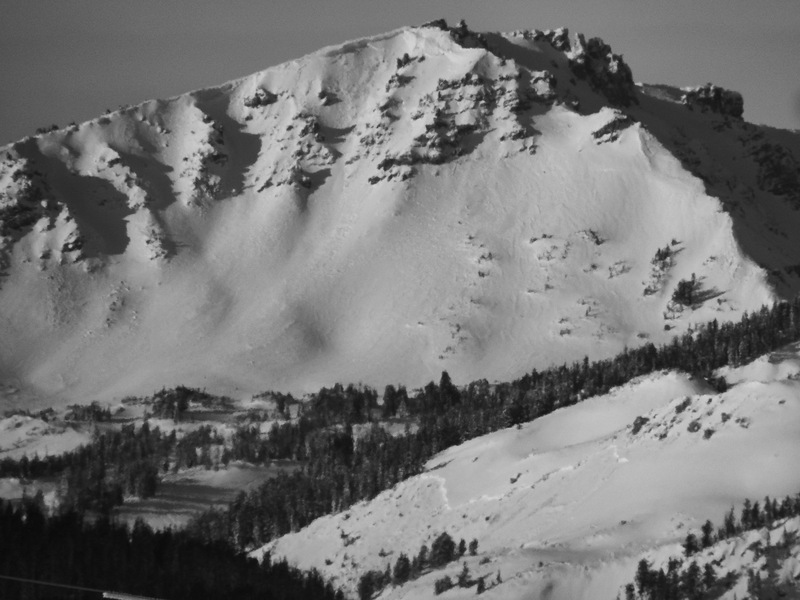 No snowmobiling and haven't ever seen anyone ski it." 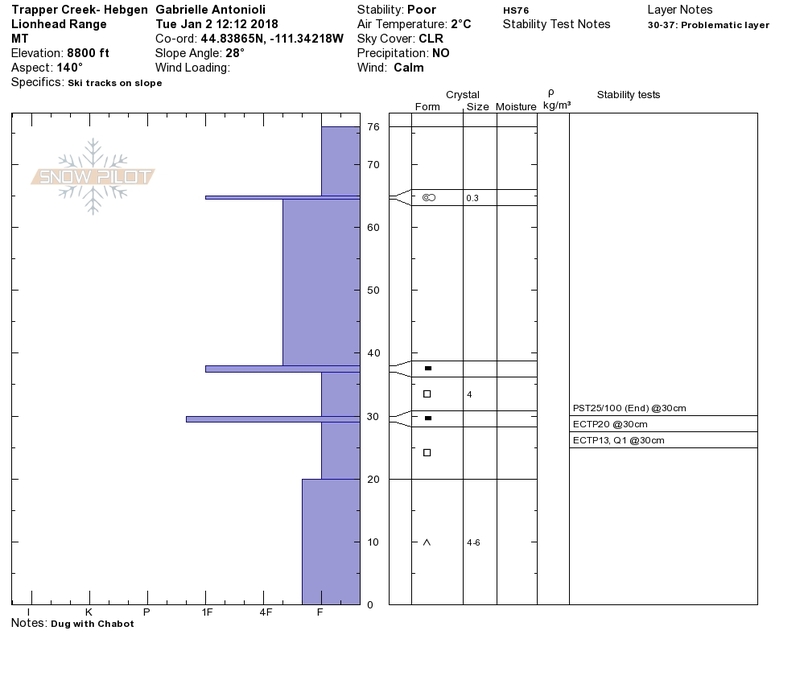 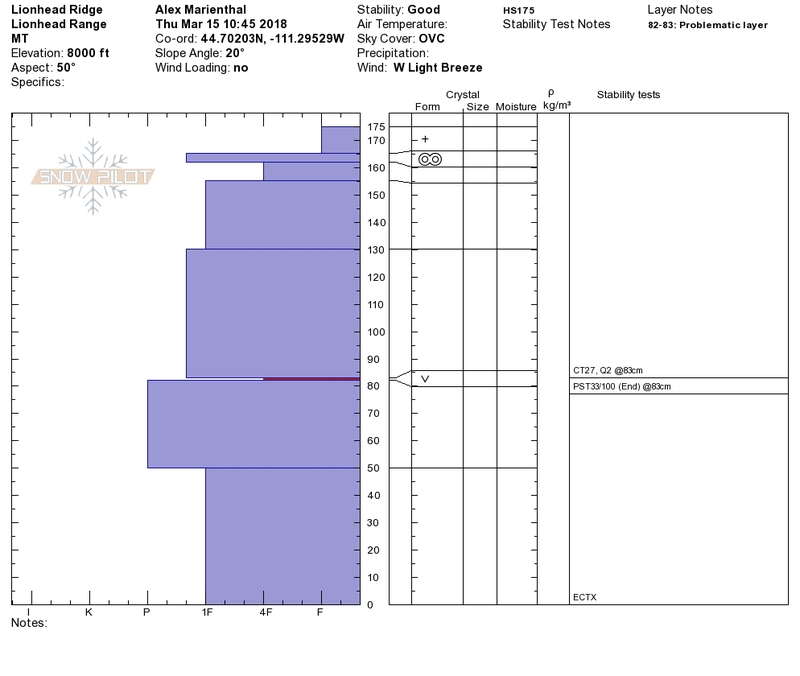 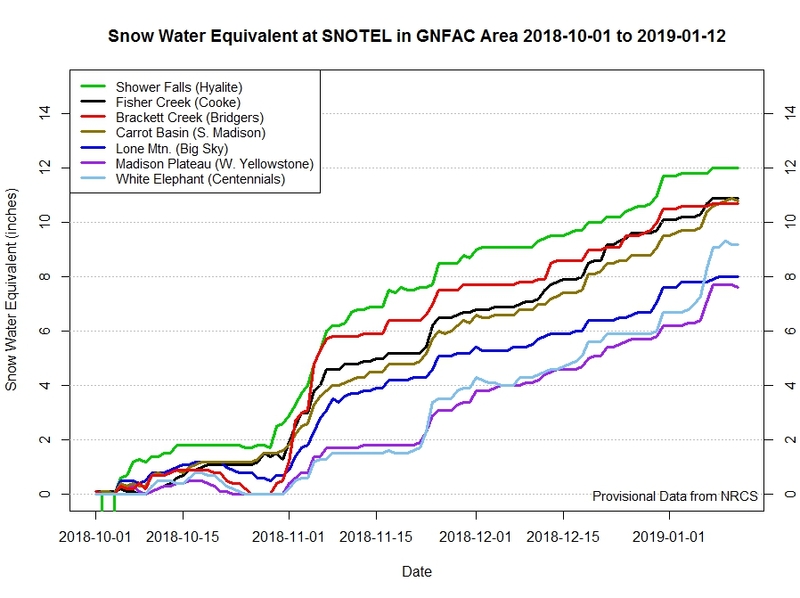 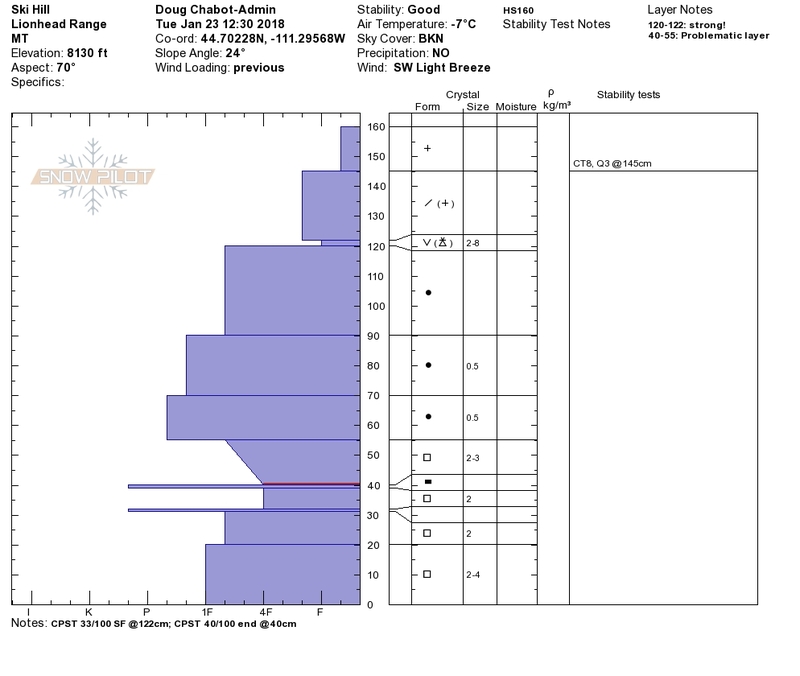 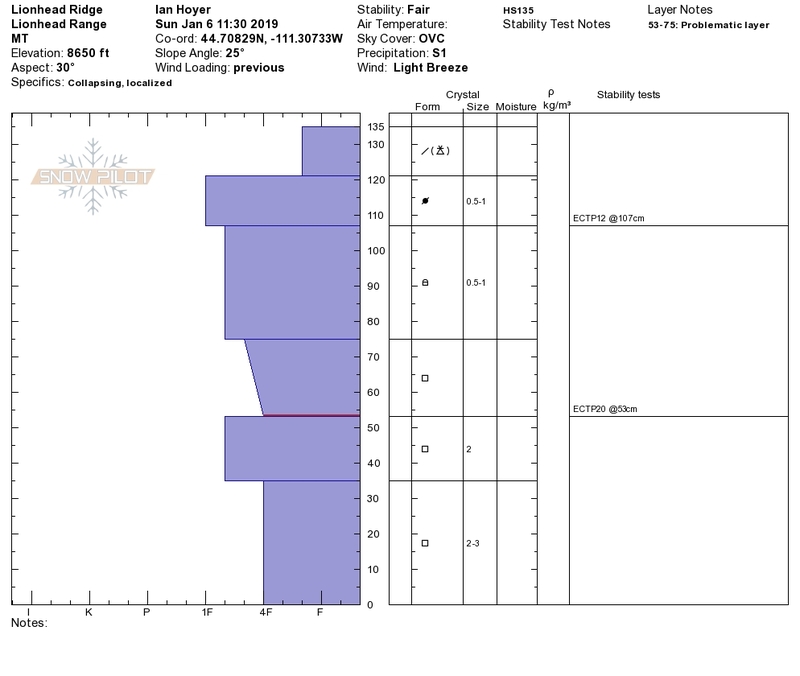 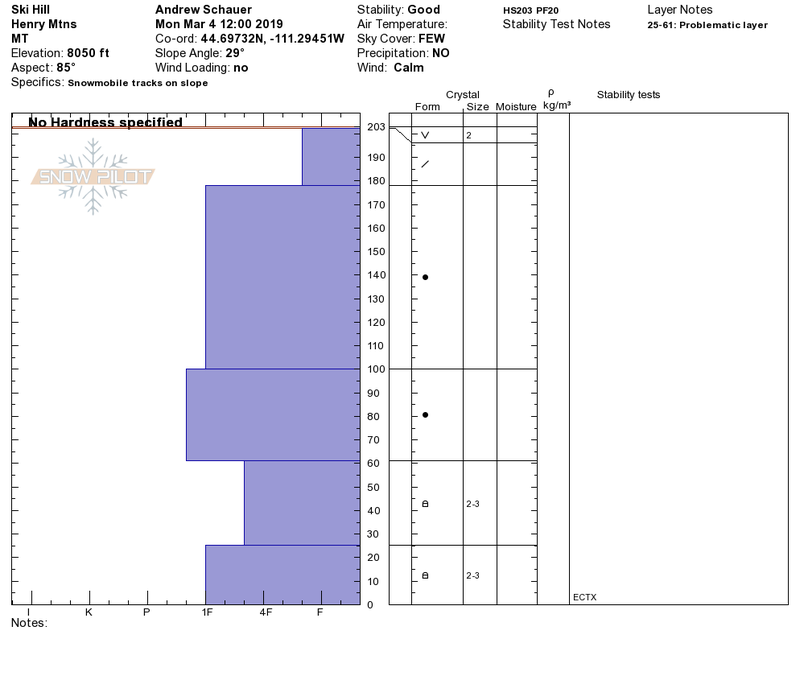 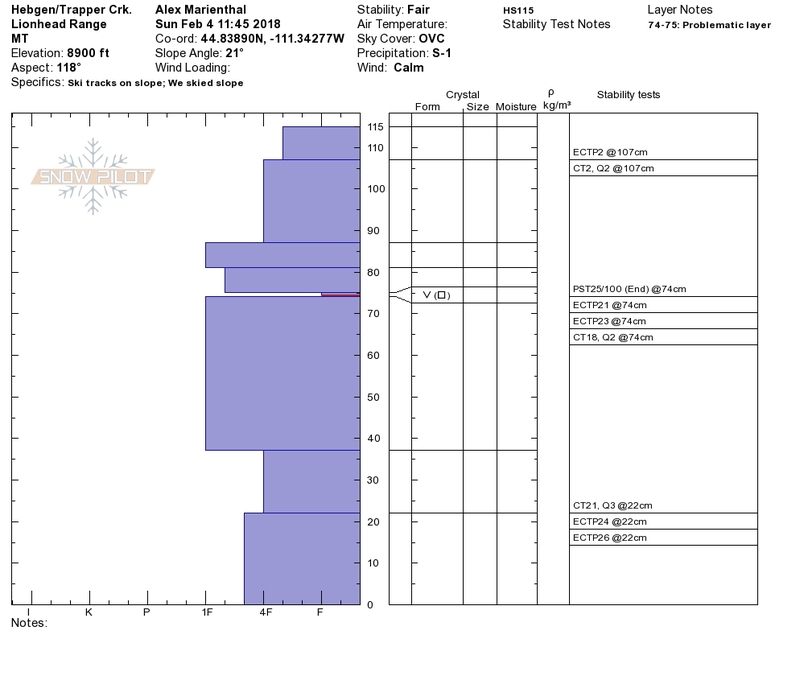 This graph shows snow water equivalent (SWE) by date at the primary SNOTEL sites that we use in the GNFAC region. 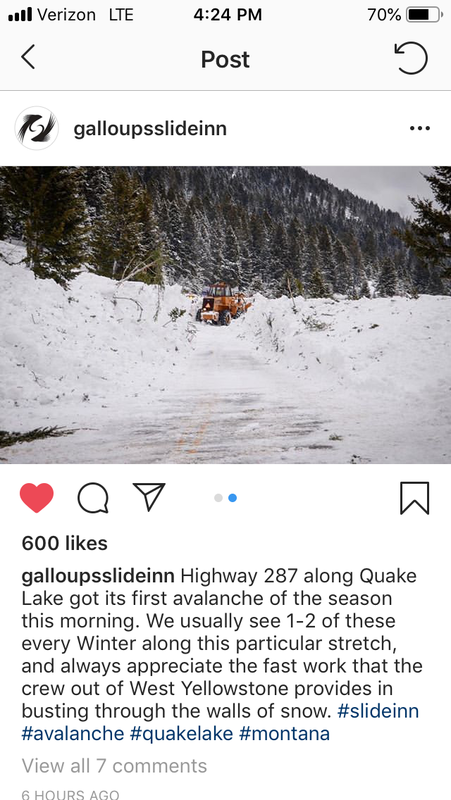 From October 1st, 2018 to January 12th, 2019. 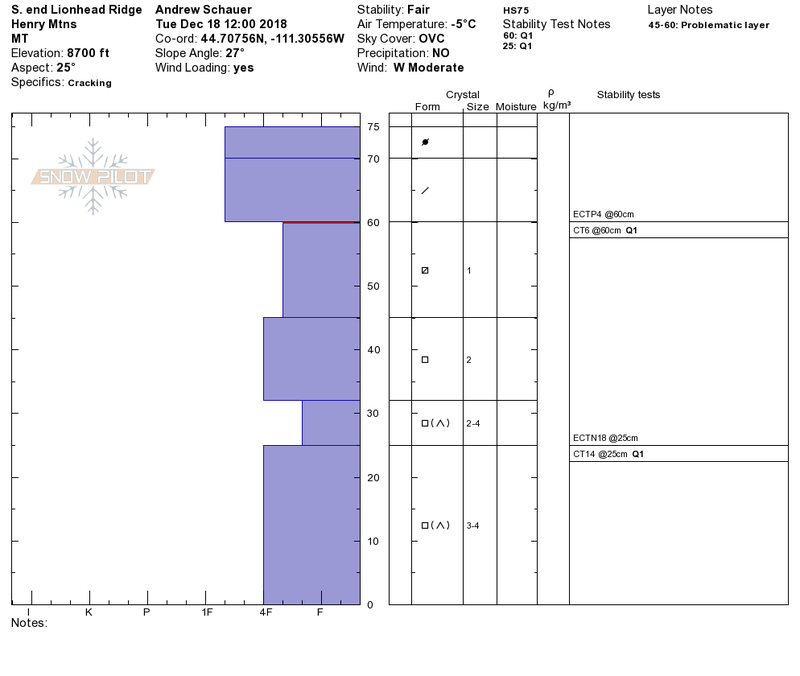 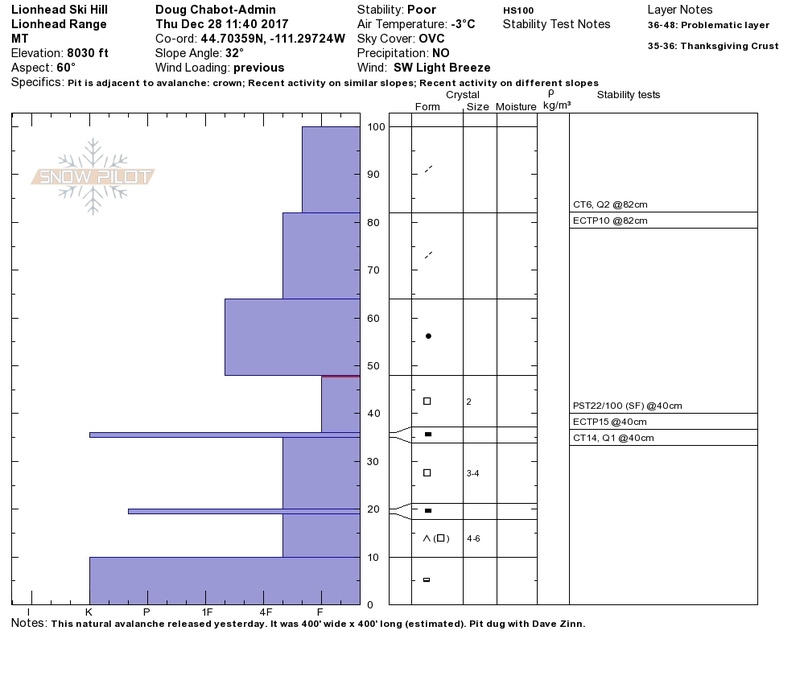 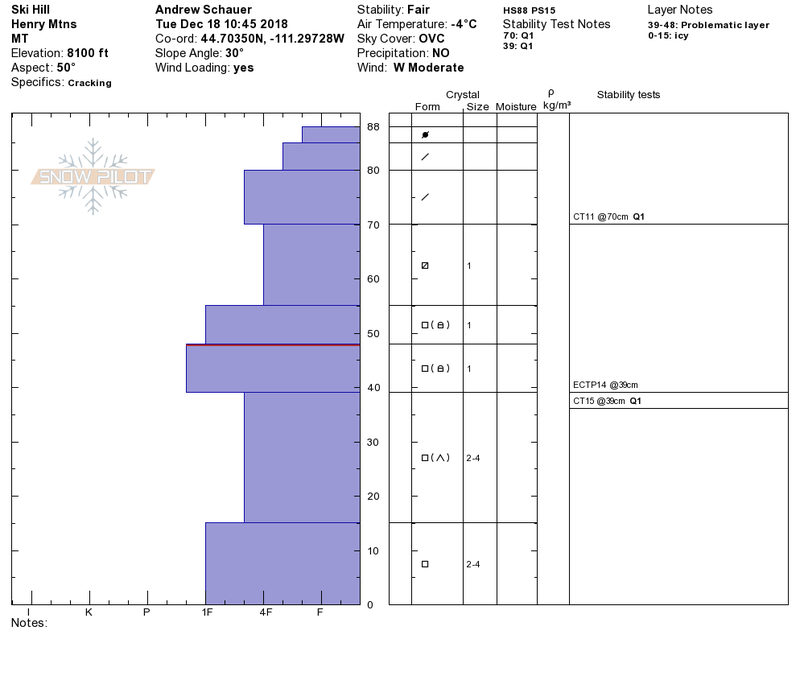 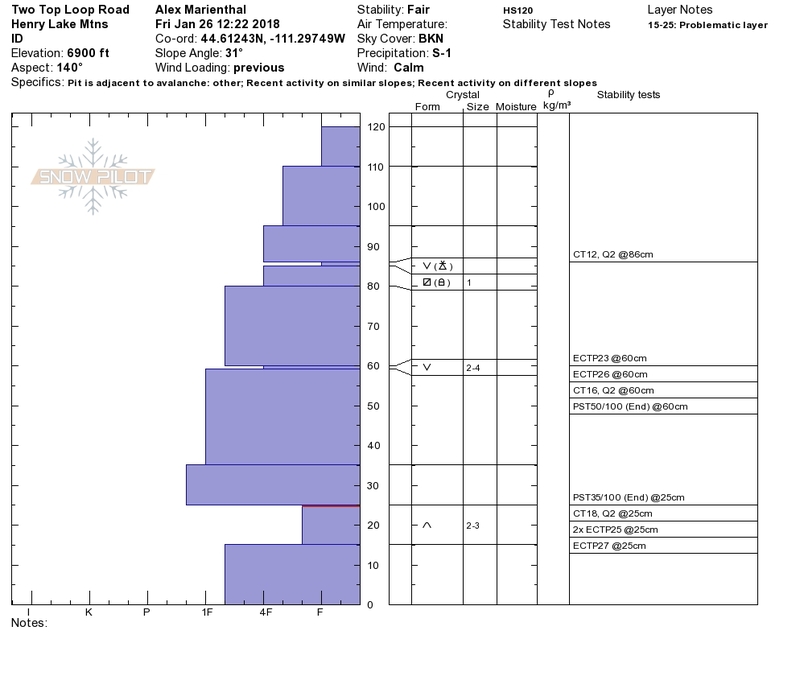 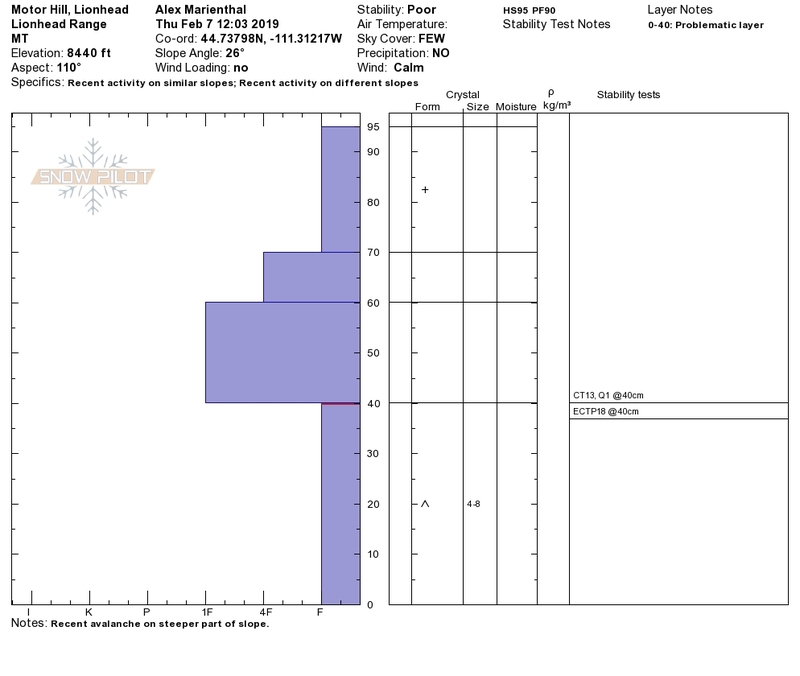 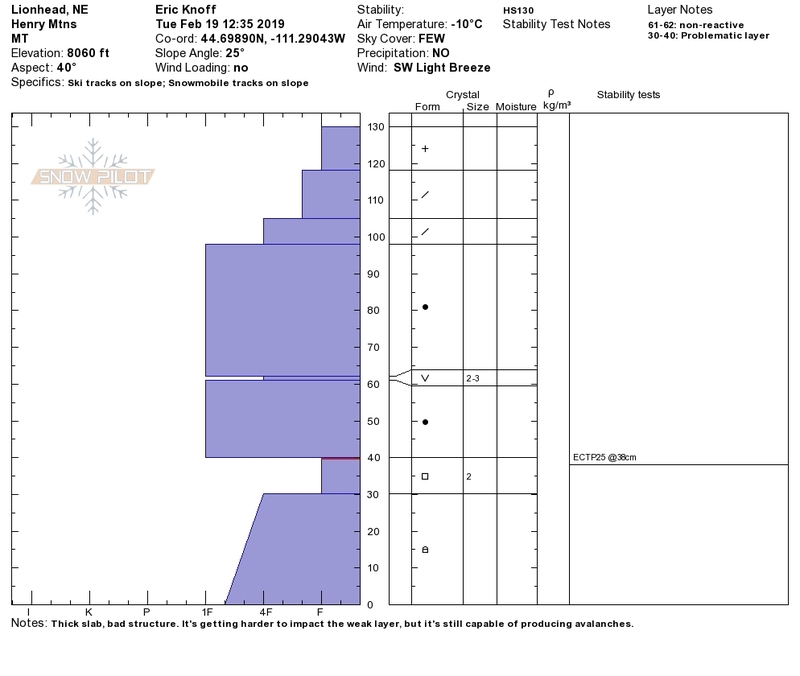 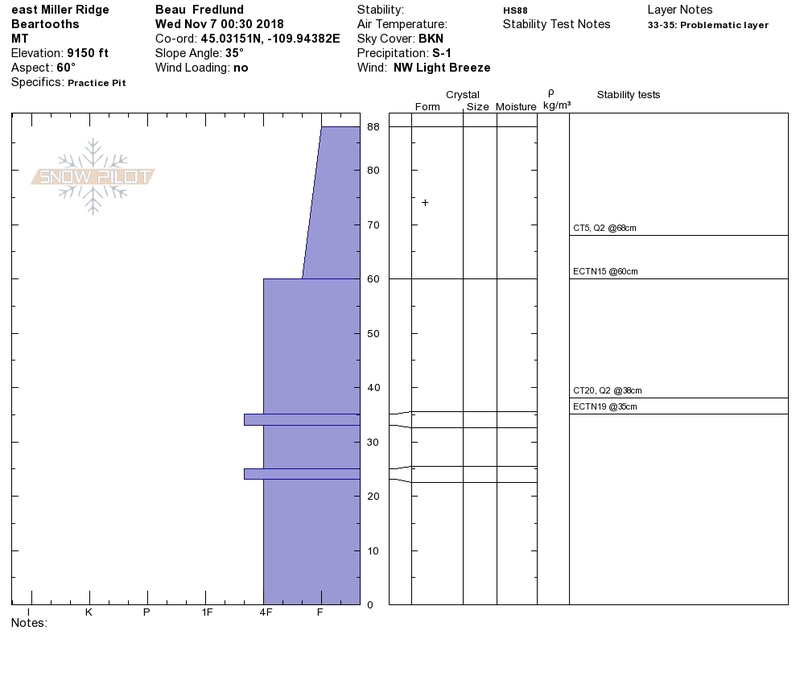 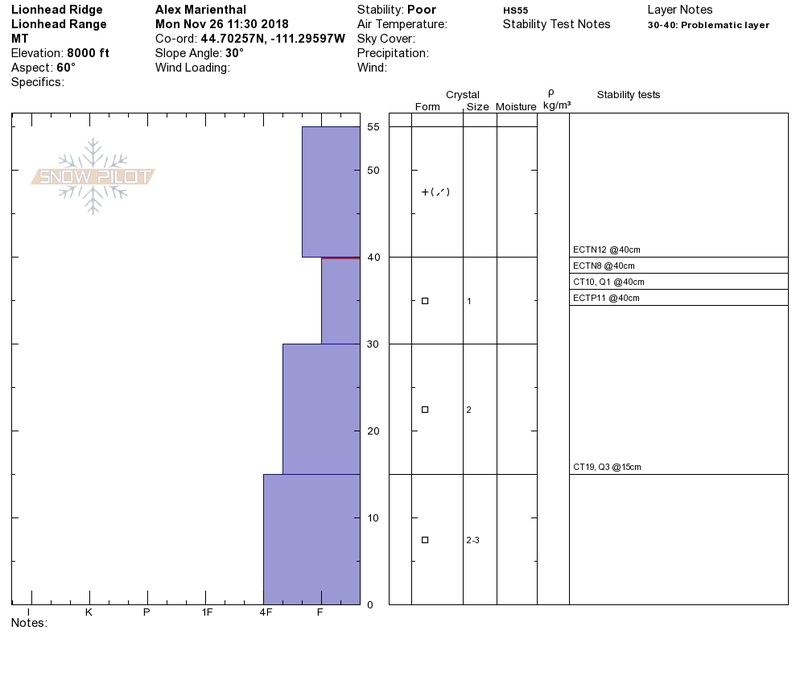 Steeper lines indicate bigger storms and flatter lines indicate periods of little to no snow. 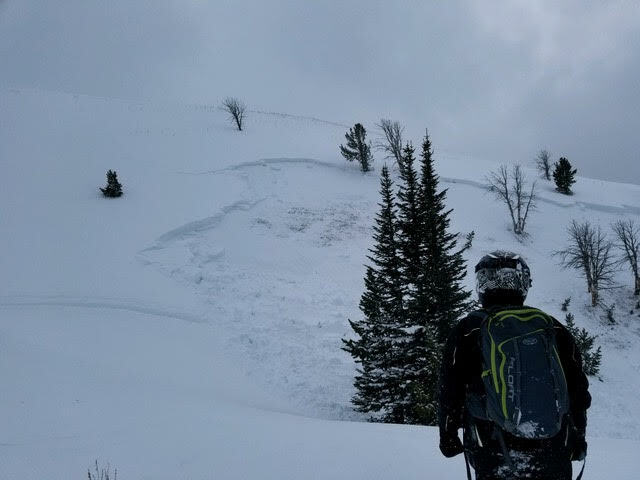 A large storm at the beginning of Novermber laid down a 1-3 foot base. 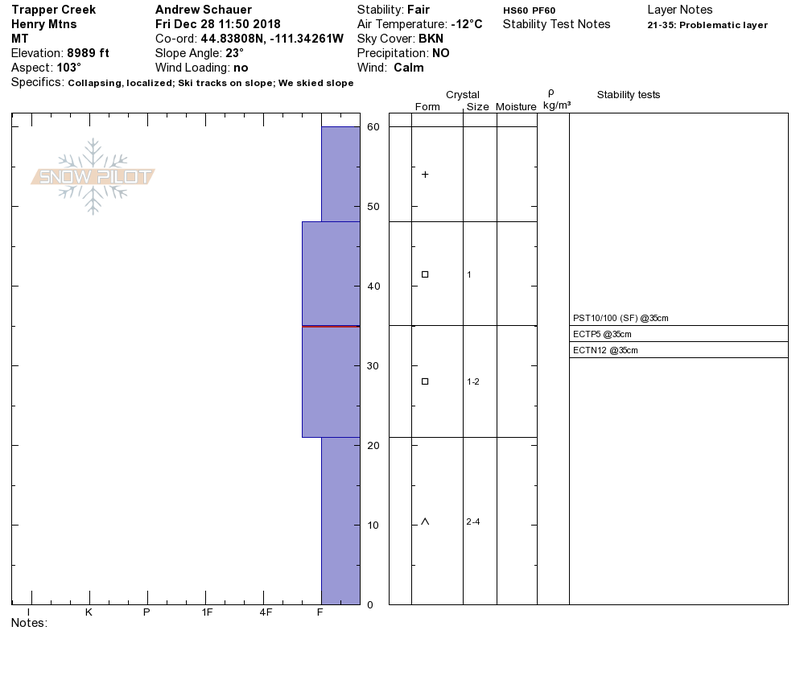 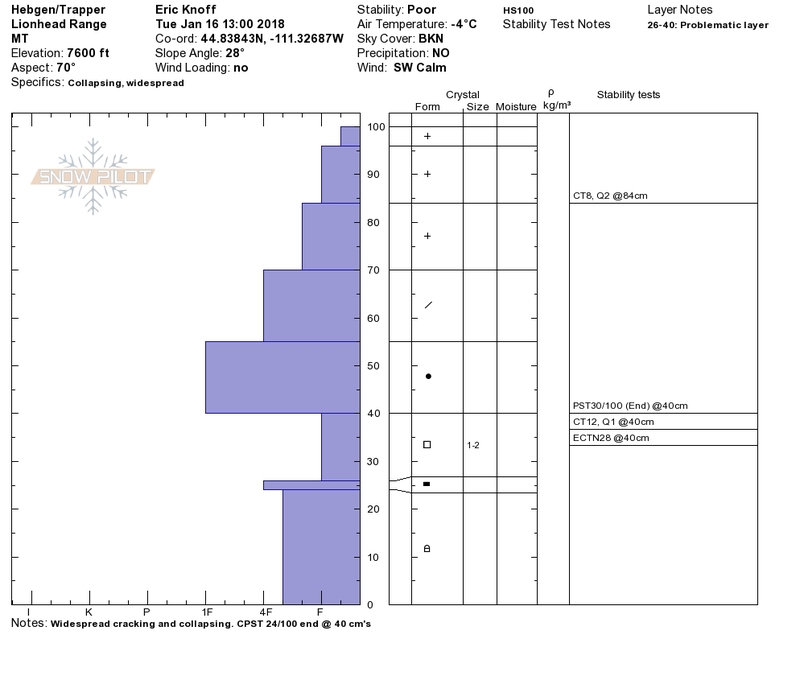 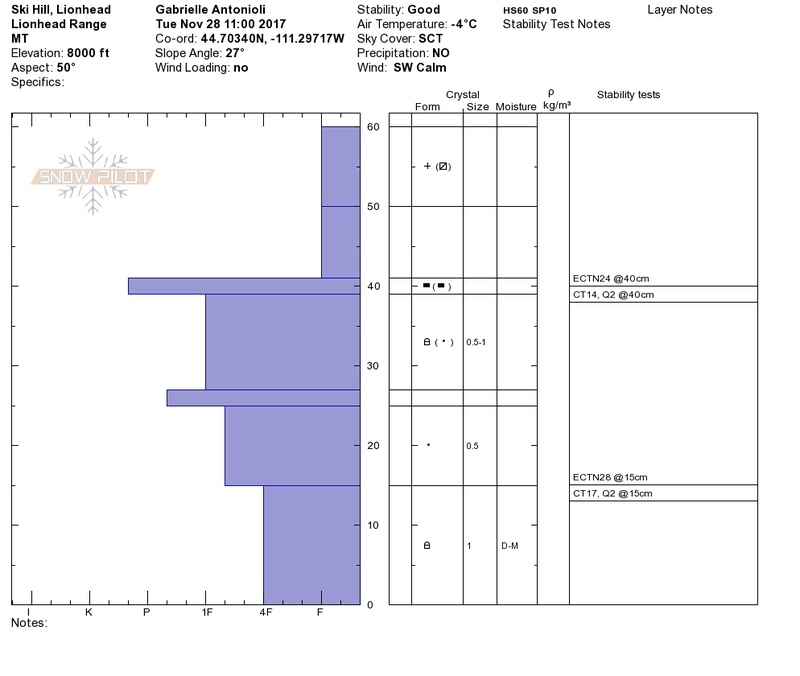 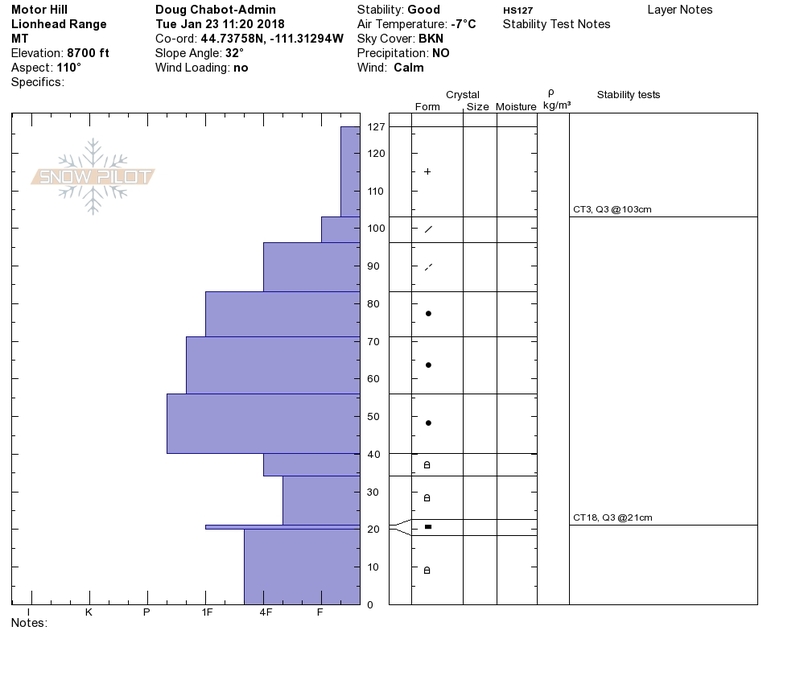 Relatively dry and cold weather through November caused much of that snow to become weak. 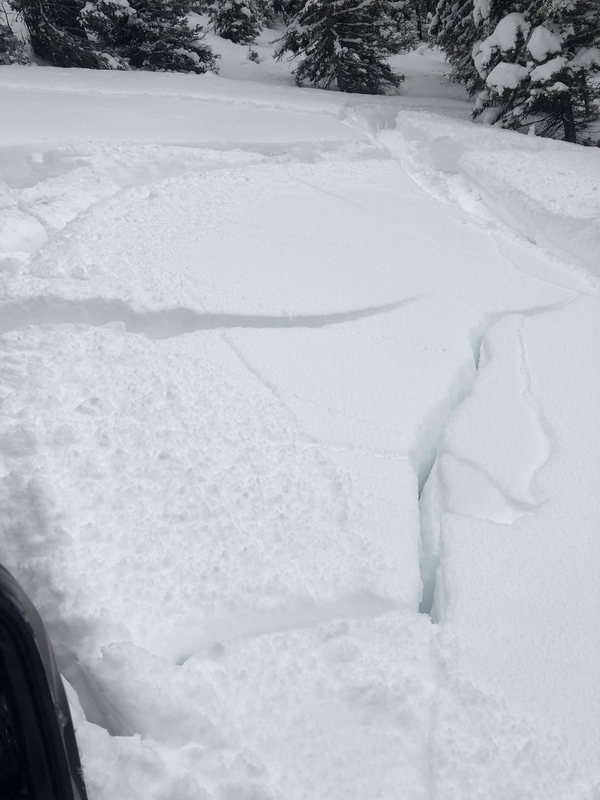 This weak snow was buried by a series of storms. 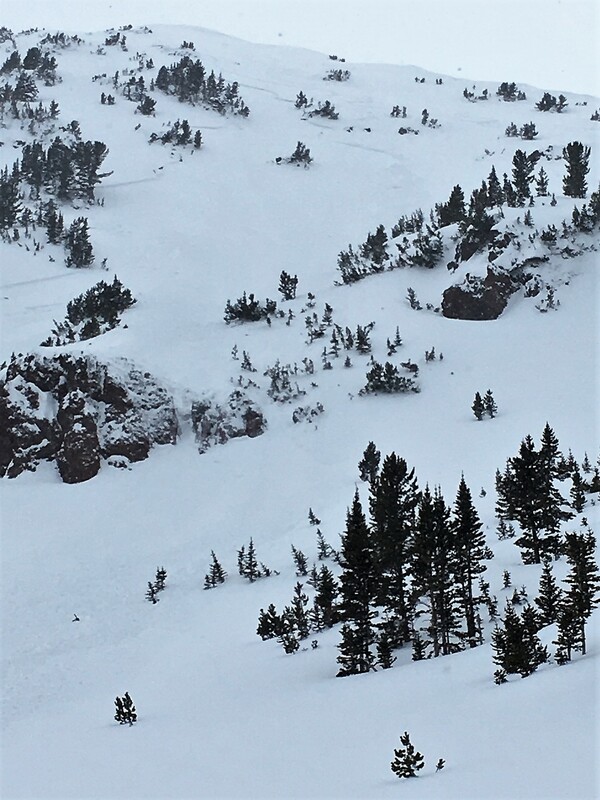 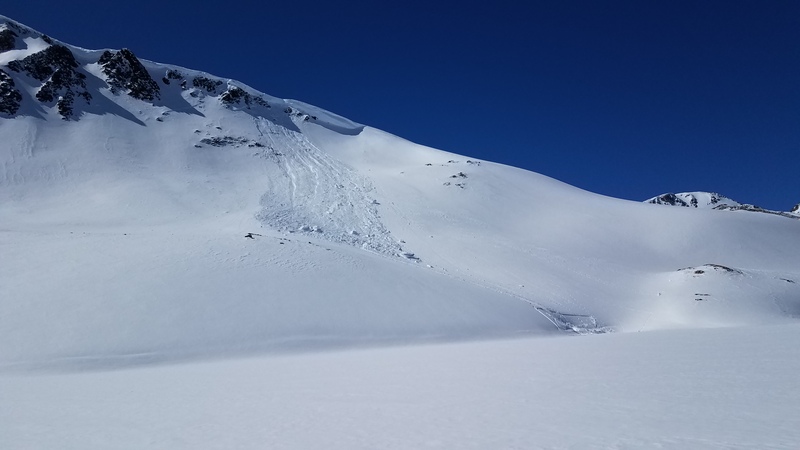 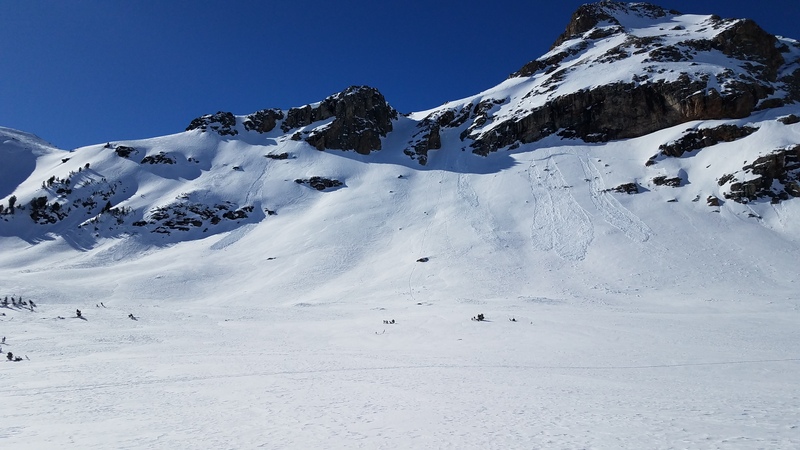 Avalanches were seen during and following many of these storms. 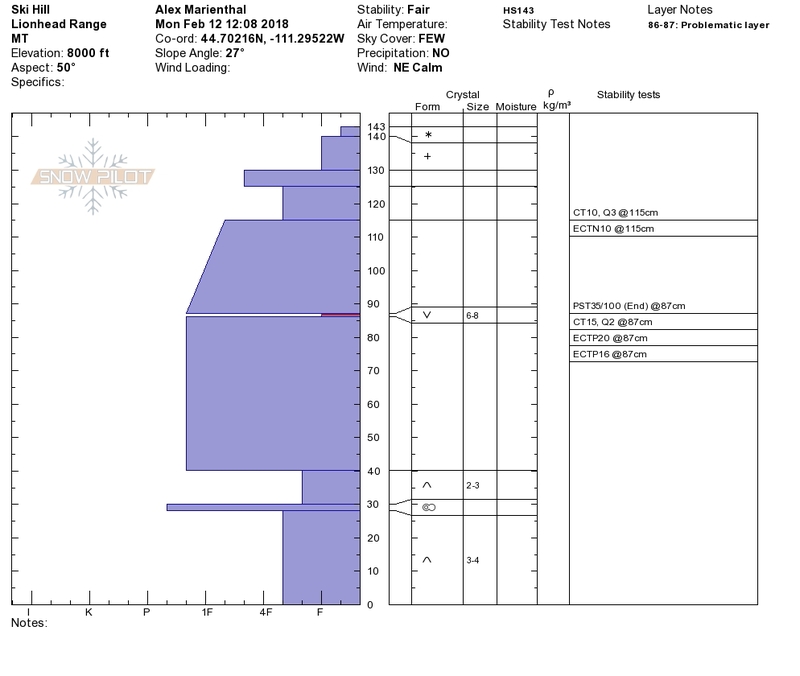 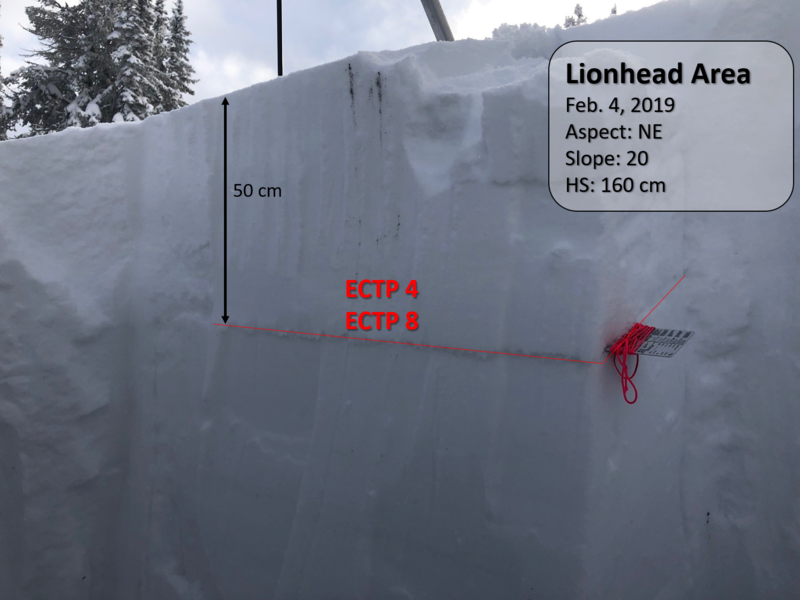 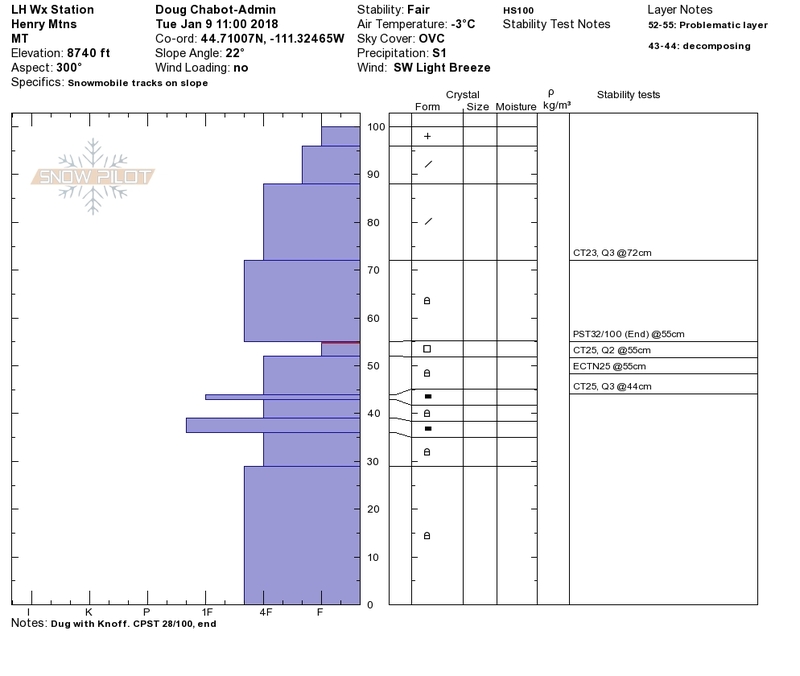 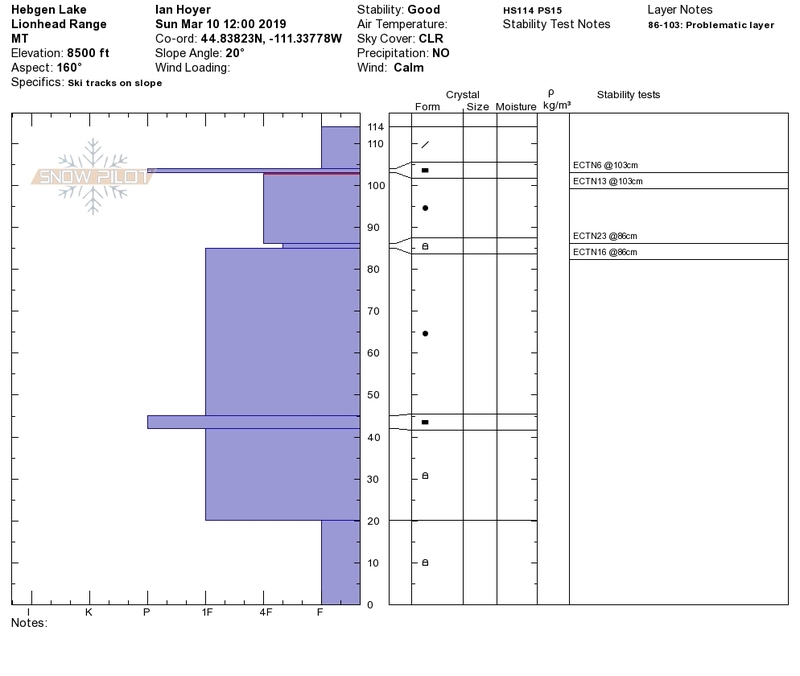 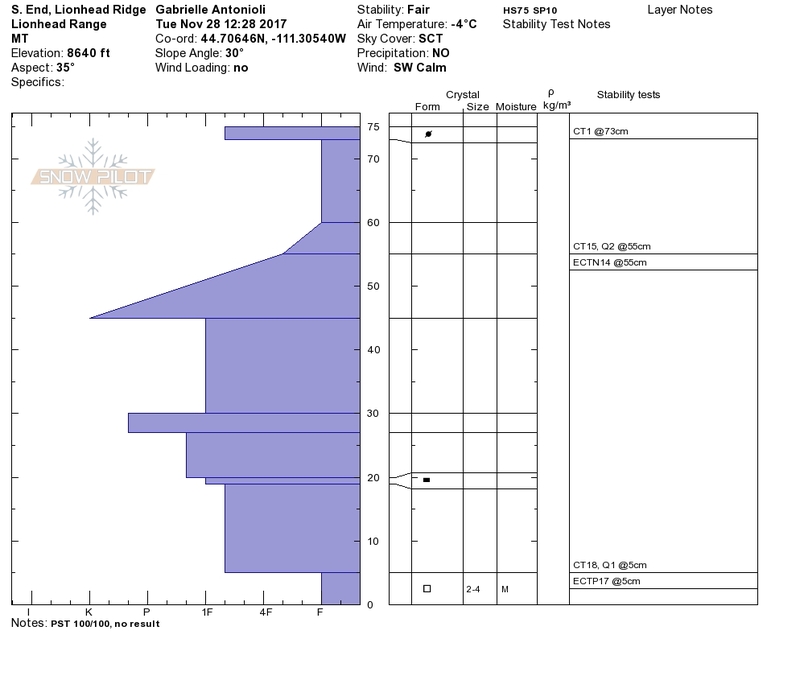 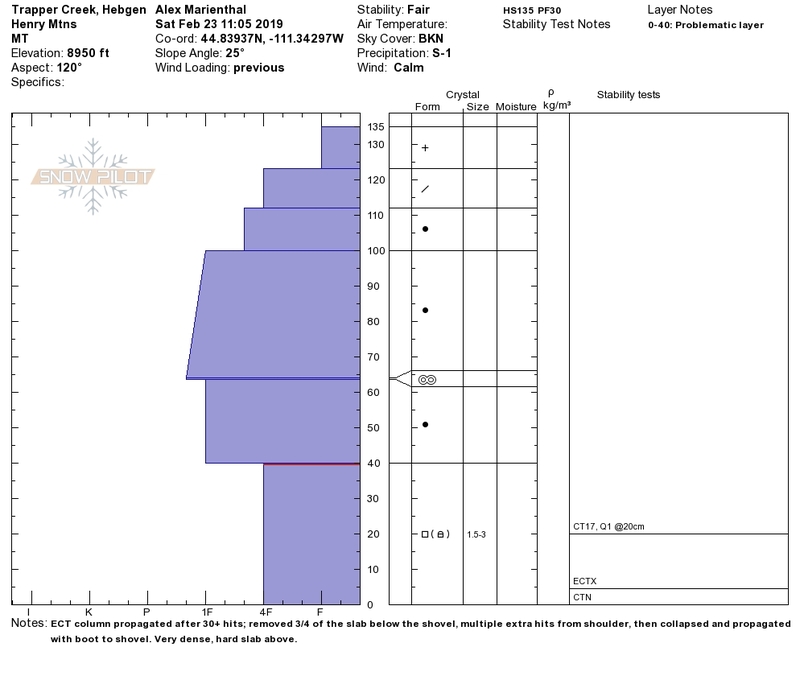 During dry weather between storms, more weak layers formed on the surface of the snowpack and were subsequently buried. 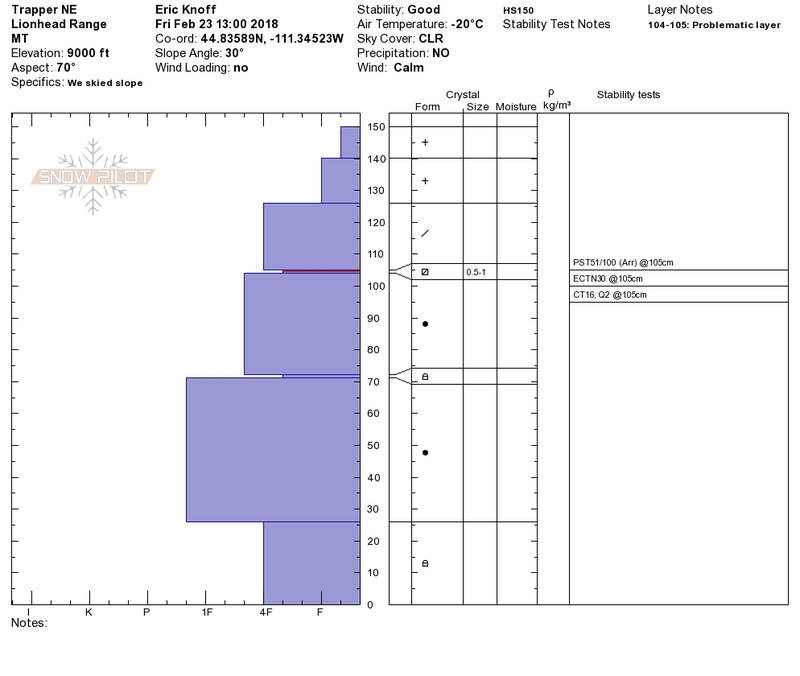 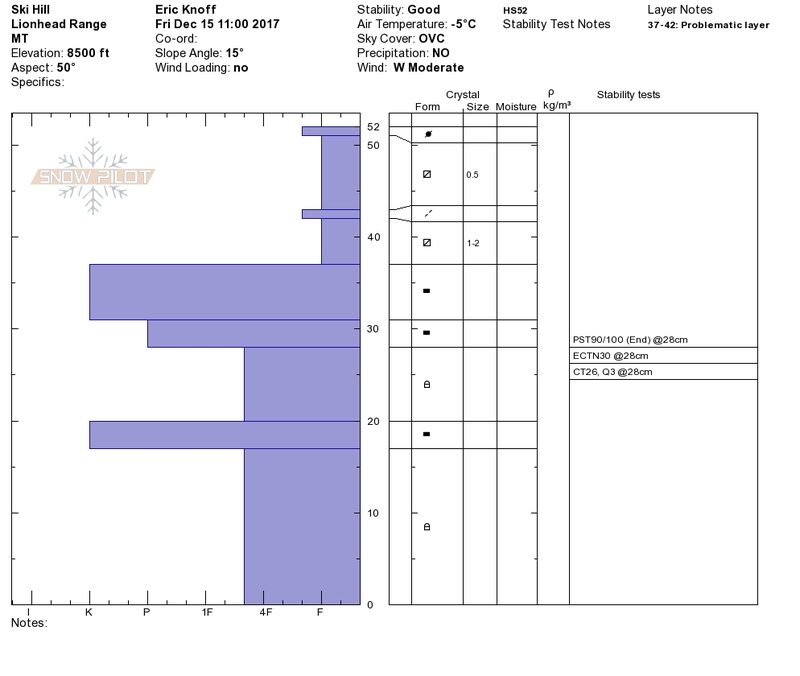 (Graph created by GNFAC from NRCS provisional data).